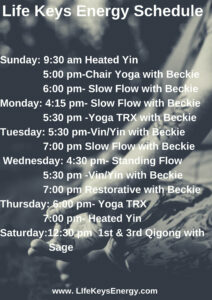 Vin/Yin- This is Beckie’s signature class. We link breath to movement while flowing through a series of asanas (poses), ending with a few held and supported asanas (poses) allowing for deep stretching. This class builds strength & flexibility, while encouraging breath & mindfulness. This class is taught in levels and is appropriate for all levels, including beginners. Power Flow- Taught by Erika, like a dance, asanas will move with the rhythms of the breath in a fluid motion. This movement helps to bring balance to the body and mind. The practice of flowing through standing, kneeling, seated, and lying postures incorporating optional arm balances and inversions will leave you feeling invigorated and refreshed. All levels welcome. No experience necessary. Slow Flow-Not sure on where to start? Start here! We slow our flow down and focus on breath and alignment. This class is perfect for anyone who is new to the practice, has injuries that require modifications, and anyone seeking a slower flow class. Restorative- This class is designed with relaxation in mind. We turn down the lights, use all the props & weight to create opportunities for passive stretching, and zen out to relaxing instrumental music. Each pose is held for 3-6 minutes allowing the parasympathetic nervous system to kick it resulting in relaxation of the mind & body. Yoga TRX- Use the TRX System as a tool to make a move more intense or as a prop allowing for accessibility in poses that are challenging. You are in full control of how intense the work out is, we will show you how to find your ideal level. This class has very limited space, ensuring everyone gets the hands on attention they require for best results & safety. All Life Keys Energy trainers are Yoga TRX certified. Chair Yoga-Does the floor intimidate you? Looking for a way to improve movement, strength, & flexibility from the chair? In this class we use straps, balls, resistance bands allowing our breath to carry us through a unique flow. Appropriate for everyone. Excellent starting point for someone who has found movement challenging. Standing Flow- Is sitting on the floor uncomfortable, but you are ready to explore standing postures with limited support? Standing Flow is for you! We will warm up in a chair and then move through tradition standing postures. As always, modifications and props will be woven into the flow. This is an excellent starting point for beginners, people who find the floor inaccessible for what ever reason, or those with a chronic illness or injury. The Gritty Yogi- YSR 12 trained yoga teachers lead this unique program. We have our own unique voice, reason, and story with addiction. If you are wrestling with addiction this may be a great addition to your recovery program. What happens when you combine the 12 step program with yoga? You get the gritty yogi! This class is designed for all levels and includes both movement and discussion. It is designed for anyone in active recovery from any addiction. Appropriate for all levels. Heated Yin- We turn up the heat & turn down the lights for this introspective practice. Yin yoga is a series of poses that are held for 3-5 minutes designed to relax and stretch the fascia & tendons allowing for increased flexibility and relaxation. We heat the room to 75 to 78 degrees to increase relaxation. Sustenance- Join us the first Friday of every month at 6 pm for a gentle candle light flow with sangha (community) afterwards. Tea and light snacks provided. The Wild Yogi-Beckie & Erika would love to share their infectious love for Gaia, and their knowledge of wildcrafting, culinary, and medicinal plant preparations, and techniques for finding stillness in our busy lives with you! This group will meet at various locations throughout Kitsap Peninsula and its surrounding areas on the first Saturday of the month at 10 am. We will connect with different plants every month, as well as, performing a quiet meditation and asana practice to help us plunge deeper into harmony with the world around as. $60 for the series or $25 drop in. Unlimited Monthly Membership~$85 a month, includes all classes, excludes workshops & special events. This is a reoccurring month to month membership, with 30 day written notice submitted to LifeKeysEnergy@gmail.com for cancellation. Mat Packs~ 5 class pack for $50, good for all classes, excludes workshops, valid for one year. Workshops are priced from $25-$65 depending on the workshop.As a general policy refunds are not given for workshops unless Life Keys Energy cancels the workshop. Workshops and studio classes are rarely canceled, but when they are it is for safety reasons. Your whole being safety is our priority. If a client no shows/late cancels more that twice and wish to book another appointment, payment is due in full at the time of scheduling. Please know that there is a service dog present in the studio. He is very friendly, but is actively working . We ask that you do not engage with him before or during class. We hand mop our floors and do our best to reduce pet dander. When You Say Yoga What Comes to Mind? How do you love you?